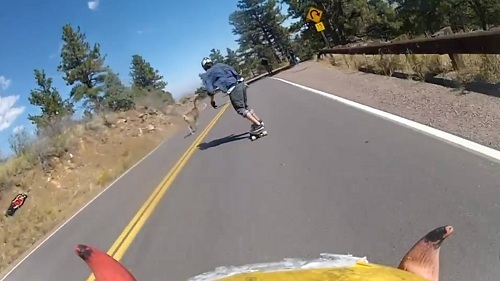 A skateboarder races down a mountain only to end up in competition with a deer. It’s a regular occurrence when people hit deer with their cars, but depending on how they collide, everyone comes out unscathed. The car is banged up, but the person is fine. But let’s say you were on a skateboard going downhill. A major race for skateboarders occurs on Lookout Mountain Road during the Buffalo Bill Downhill race in Colorado. The race was a little more interesting when others, without a skateboard, decided to participate. The skateboarders were preparing to fly and just when they extended their arms into the air and lean into it, a deer came to show them that they did not know speed.